2 bottles of Everclear (95% alchohol, 190 proof)--yep, that's right baby. Yum. With a zester or veggie peeler, remove only the zest (the yellow rind) of the lemon--being careful to leave that nasty white pith under there untouched. Place the lemon zest in large jar with a lid and add all that noxious alcohol (4 bottles). 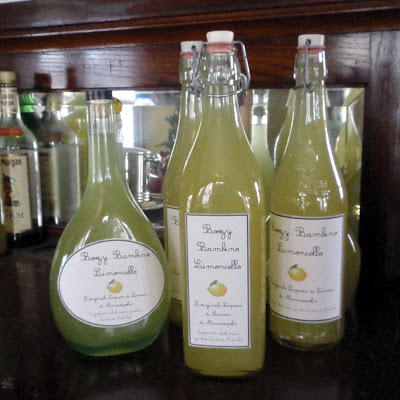 Store in cool, dark place--remembering to visit the embryonic limoncello and give it a little shake daily so you swirl the liquid and zest around. Do this for about 3 weeks (you can go as long as 4 weeks, if you prefer). Round about the 21st day, bring the water to a boil in a sausepan, then add the sugar and remove from the heat, stirring the sugar until it dissolves. Cover and let cool to room temp. Meanwhile, get out the jar of embyonic limoncello and strain it through a fine sieve, then discard the lemon zest. Put it back in the jar, add the simple syrup (the sugar and water mixture), and stir for a couple of minutes. Store for about 3-4 weeks longer, again, giving it a little shake daily or even twice a day, if you are diligant and can remember to do this. 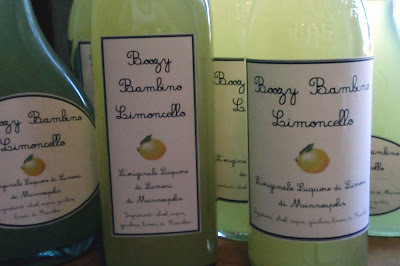 Now, you are ready to transfer your Boozy Bambino Limoncello to bottles--ones with rubber stoppers work well--just make sure the bottle is fairly sterile before using. 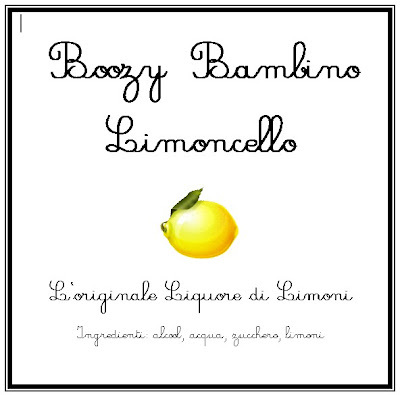 You can use this label here (to save it, right click or select it and copy to your computer--we printed our on full page shipping labels from Office Max) to give it that final crafty touch: ...or make up your own dumb Limoncello brand, if you have the motivation. Limoncello is traditionally enjoyed at the end of the meal, served from the freezer (where it will take on an even cloudier appeal) in a small glass. Bella! Ciao, and happy new year to all of you. a simple way to attach the labels to bottles, is to print them on normal paper, and either wet them with milk or liquid starch (like for dress shirts) and when the label is still damp apply it to the bottles and when it drys it will stick great. they also will come off in about a 15 minute soak in warm water and oxy-clean so you can reuse the bottles. Its an old homebrewer trick.